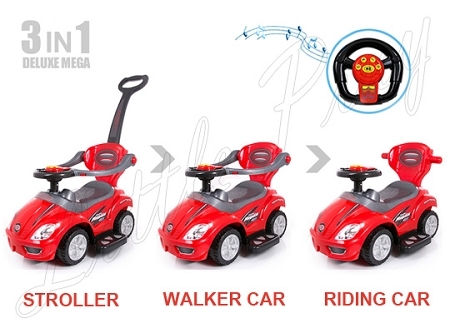 Features: Deluxe Mega 3 in 1 Car Children's Toy Stroller & Walker Combo Can Be Stroller, Walker, Riding Car! Recommended Age: ~3-6 years Working Horn and Music Sound Buttons on Steering Wheel, Underseat Storage Bin, Maximum Load: ~50 lbs. 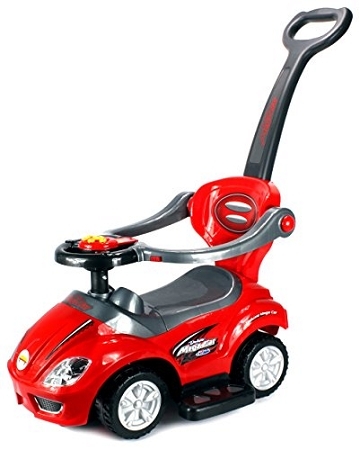 Extremely Durable and Comfortable, Easy Push Handle Design Steering Wheel Requires 2 AA Batteries to run (not included), Approx. Dimensions: 33 x 17 x 33"
Copyright The Baby Shop/ Lot of Toys. All Rights Reserved. eCommerce Software by 3dcart.